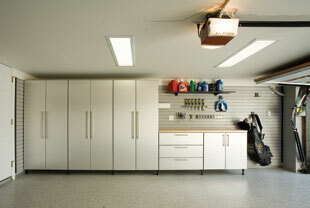 Garage Envy offers wide range of custom garage makeover solutions ranging from garage doors, flooring, walls cape etc. The standard two-car garage of the 1960s home of a prominent Los Angeles restaurateur was dilapidated and dingy — crammed with catering equipment, surfboards, rolls of carpet, an antique bar and dozens of cases of wine. Garage Envy designed a new garage space to meet the specific personal and business needs of the owner. The garage features the company's patented modular wall system, which accommodates baskets, shelves and all manner of hanging accessories that can be rearranged; brushed-aluminum cabinets that can hold heavy items; and a 2,500-bottle climate-controlled wine cellar created from a storage room. Part of the garage will be used as a staging area for events catered by the homeowner's restaurants. The garage's smooth, easily cleaned Liquid Granite floor is ideal for food-related equipment. 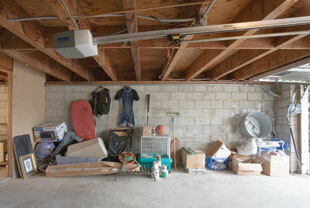 A complete storage & organization system by Garage Envy Inc.Call Us Today 888-248-8544 for Free Design Consultation.